We’ve elected not to continue feeding fermented grain through the winter. We think the experiment was successful, though as I mentioned before, so many things were different this year that it was very hard to quantify any cash savings. Once we seemed to get the protein situation under control, the birds did as well as they ever have, and our cost per pound of feed was less. With far more bird than we’ve ever had, especially the large ones (turkeys, geese, ducks) we could not quantify the poundage savings, if any. 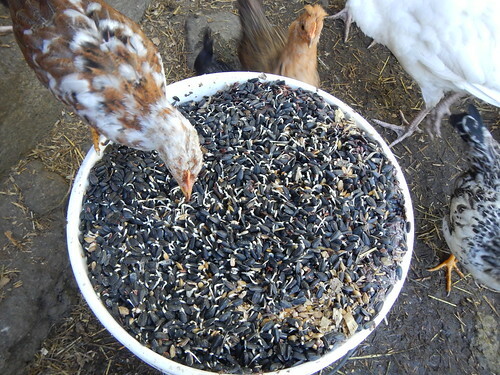 However as the birds got bigger, we had difficulty giving the grain the required five to seven days to ferment. We simply did not have the room in the barn stall that we were using. This only got worse as the quantity of forage began to drop off, and we had to feed more and more. There simply is not enough space in the basement for that much fermenting grain. We still haven’t gotten our mealworm production high enough replace the foraged bugs either. I also noticed that the last clutch of baby chicks pretty much stopped growing in October. So around November 1, we bought Blue Seal Multi-Flock pellets and started feeding them as we used up the last of the other grain. Nobody complained, and the chicks started growing again. Maggie even lived on it for a week or so while refusing to eat raw rabbit or chicken. I’m also no longer worried about either protein or calcium. Next year’s plan (I hope) is to use the center of the barn to process the grain in, which will give us enough space to ferment grain for everyone through the warm weather. The previous two posts for those interested: Fermented Feed and Fermentation Follow-up. Don’t forget that we have our 2014 Mack Hill Farm Calendar ready. It came out really nice this year. This entry was posted in Birds. Bookmark the permalink. Post a comment or leave a trackback: Trackback URL.